Seven species of marine turtles exist in the world's oceans today, all of them have unique lifestyles in that they travel great distances and take decades to mature. This makes turtles important indicators of ocean health. There are five species found off the Kwa-Zulu Natal Coast, namely, the loggerhead, leatherback, hawksbill, green and Olive Ridley turtles. Of these five species that occur in South African waters, only the loggerhead and leatherback females nest along our shores. 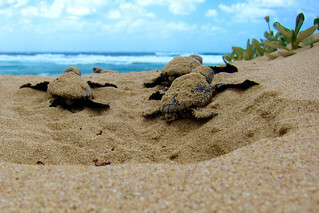 Both loggerhead and leatherback turtles nest during the summer months at night (October - March). They use medium to coarse grained sandy beaches that are backed by high dunes with well developed primary vegetated dunes. Steep beach faces makes it easy for loggerheads to swim through the surf over low lying rock ledges. The females emerge from the surf and rest in the wash zone on the beach. It is here when they assess the beach for any danger by lifting their heads and scanning the beach. Satisified that there is no danger they then proceed up the beach to well above the high water mark. 1. Nesting - Egg collecting, slaughtering for meat, coastal development, sand mining & beach driving. 2. Home Ranges - (coral reefs, sea grass beds, open oceans) These are disturbed or destroyed by bad fishery practices, pollution and global warming. 3. Migrational Movements - During migrants they are threatened with being caught in trawl or drift nets and long lines. The project began in 1963. In 1916, all harvesting of sea turtles was banned in South Africa, and from the early 1960's, concerted efforts were made to enforce legislation banning egg collection and the harvesting of adults. This was aided by effective continuous and high-intensity monitoring. In 1963, under the auspices of the Natal Parks Board, a Turtle Conservation and Monitoring programme was initiated along the north- eastern coast of Kwa- Zulu natal which is now the Greater St Lucia Wetland Park. This programme, currently under the supervision of Ezemvelo KwaZulu Natal (EKZN) Wildlife, is still in existence todat. It is one of the longest, continuous loggerhead/leatherback turtle monitoring programmes in the world. The 56 kilometer of beach, north and south of Bhanga Nek, in the Greater St Lucia Wetland Park, is the main focus area of the project. During the peak nesting season (mid- October to mid - March) intensive patrols are conducted by students, field rangers and temporary staff for the entire 56 kilometres. About 20 km of this stretch of beach is patrolled throughout the year. Sixteen local community members have been trained as monitors and are employed over the nesting period (October - March) to gather valuable data. 1.The ongoing monitoring and conservation efforts have had a positive effect on population size. Since the programme's inception, a total of 46, 893 loggerhead and 11,509 leatherback females have nested on the beaches of The Greater St Lucia Wetland Park. 7.The programme served to increase public awareness and create tourism benefits along the Park's beaches.